The days of employees remaining at a company for the entirety of their professional career are fading. According to 4 Ways Millennials Are Changing the Workforce, on average companies can expect to lose most of their employees by the seven-year mark. The older generations of employees, Baby Boomers and Generation X, tend to leave the company by the seven-year mark. The tenure of millennial employees is even direr. Millennials, unless incentivized to remain, tend to move onto ‘bigger and better’ opportunities by the two-year mark. We’ve talked in the past about the financial fallout of employee turnover. Employees are expensive to hire and expensive to train. Months might pass before companies recoup the loss of hiring an employee. Even though, the majority of employees will eventually leave your company. It is important to do everything you can to encourage them to remain a valuable employee for as long as possible. No one likes to spend the entirety of their career being micromanaged. Millennials, in particular, value jobs where the leadership teams are mentors who will guide them rather than managers who will tell them exactly what to do. Yes, a certain degree of micromanaging is vital for new employees who don’t quite understand how to do their job. The longer an employee remains at the company, the more they can productively manage themselves. Employees will appreciate the company trusting them to be able to determine what they need to do to succeed at their job. Manager’s ability to exhibit that level of trust can be vital. According to Inside the Mind of a Successful Manager, one in three US workers wants to jump ship to a new job. Managers can be a key factor that can prevent employees from jumping ship. 65% of American workers will take a better boss over a pay raise. It’s worth investing a little time and money to ensure your company’s management team is capable of being a truly inspirational and effective leader that recognizes when to micromanage and when to grant a little more freedom. The modern employee is more than happy to flee a dead end job. The days where the average employee will remain at a company that offers no professional growth potential are coming to an end. Millennials, in particular, value a company’s ability to help them grow. Your company can encourage employees to remain at your company longer by tapping into that desire. Try to promote from within the company. Allow employees who are getting a tad restless switch to a new department. Give each employee a certain amount of time a month they can dedicate to learning new skills that will benefit their job. Modern technology has led to the rise in companies offering their workers more flexibility in terms of where and when they work. Part of the reason businesses are slowly abandoning a traditional 9-5 work week is due to the fact it can be a cheap method to give employees a reason to stay. While 45% of millennials reported that they value higher job flexibility over higher pay, only 63% of American workers are expected to be given the option of telecommuting by 2021. At this point, companies can easily stand out by adopting either a telecommuting or flexible schedule policy (or both). While this won’t work for all types of businesses and job titles, most traditional office jobs can easily adopt more flexible work policies without hurting employee productivity. If you do think that you might want to consider adopting either a flexible schedule or telecommuting, I would recommend adopting a free or paid online communication tool and a project management platform to help ensure that workers maintain the same level of communication. Don’t rush the integration and adoption of new perks and processes. Rushing the process could lead to the new perk beginning as a huge money wasting flop. This could effectively kill an idea that could have been a very effective perk. Research how other companies integrated the perk into their workflow. Determine if the perk will be open to all employees or contingent on meeting certain parameters. Potentially write a contract that an employee will have to sign in order to utilize the perk. 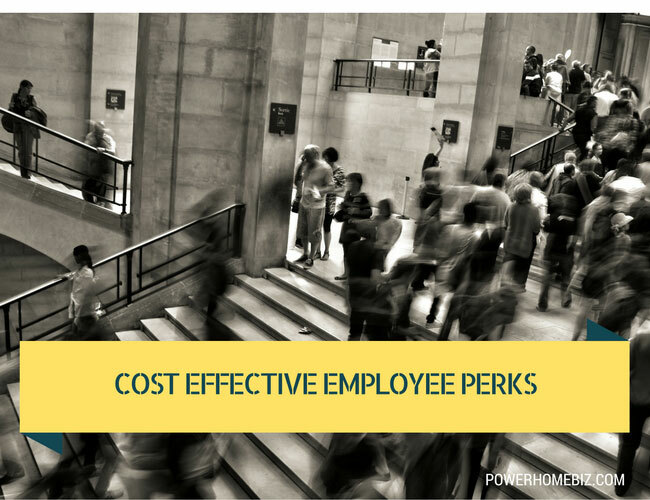 Have manager and/or human resources ensure that the perk is not being exploited. Employee retention is highly dependent on companies proactively attempting to entice employees to remain at the company. While companies should not expect employees to remain with their company for their entire professional career, they can ideally encourage employees to remain just a little longer than normal.